This week – on the 1st of June – I started making Ensō. The reason why I started was an accident, but once I’d begun I began to feel like making Ensō was exactly what I needed and the enjoyment and peace I’ve been finding within the slow, mindful making of circles has been enormous. So helpful and satisfying has it been that after two days I decided to make them for a week. And now I’m thinking that I’ll continue for a whole month, and want to invite you to do so too. 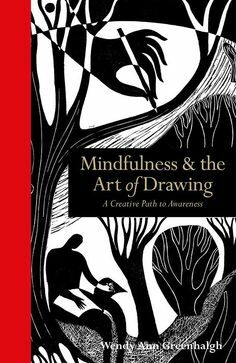 Below is an extract on making Ensō from my book Mindfulness and the Art of Drawing – plus a simple Stop Look Breathe Create practice on how to make them for yourself. If you’d like to embrace this simple creative mindfulness practice with me (it can be accomplished in just a few minutes) then I’d love to see your Ensō. 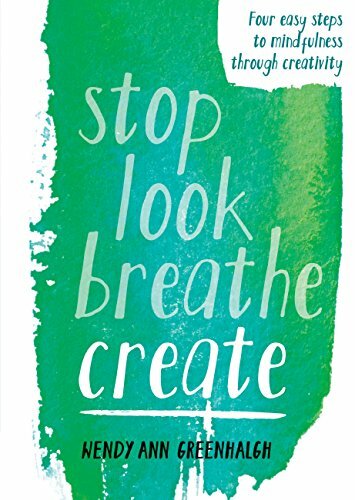 Please do post them on the Art of Mindfulness Facebook Page – or share them on Twitter or Instagram using the #stoplookbreathecreate and #ensoaday hashtags – you can tag me in too if you like, I’m @storyscavenger on Twitter – and @artofmindfulness on Instagram. I’ll be posting my own Ensō every day. Extract from Chapter Six – Coming Full Circle, Mindfulness & the Art of Drawing. Simplicity is an expression of the clarity and spaciousness of mind that allows the body to move and create uninhibitedly. In the Japanese Zen tradition, this idea of an artist free to make marks that are an expression of the uniqueness of their own being is explored through the drawing or painting of circles – called ensō. Ensō – sometimes called Zen Circles – are usually made with one continuous movement of brush or pen. Ensō is a sacred symbol in Zen Buddhism, where it’s know to represent infinity and enlightenment. It can also represents the oneness of life, completeness, emptiness, harmony and, of course, simplicity. There is an extraordinary beauty and elegance to ensō, and it is its simplicity, the minimal nature of the single brushstroke on the page, the closed (or sometimes partially open) circle, that makes it so. Ensō, as a symbol, also represents the artist too, the maker of the mark. The artist’s mind is revealed in it, captured in the act of creating it, along with their acceptance of imperfection, for it is almost impossible to draw a perfect circle. The ensō is a drawing that is the manifestation of a single moment and of all that we are and are not within than moment. Within its form is held the life of the drawer, their mind, heart and body, as it flows through their arm, through the pen or brush and onto the page. Every ensō is different, each circle varying in the tones of ink, mark or brushstroke, the shape of the circle, even in the point in the circumference where the artist chose to start. Ensō are in this way a complete expression of our individuality. There is something extraordinarily peaceful about ensō, there is so much space in them, and yet they are contained, balanced. In drawing them, we come back to the pleasure of simple mark-making. Here are some simple Stop Look Breathe Create instructions for drawing ensō. The whole practice can be experienced with just a few breaths – so there’s always time to fit it into the busiest of days. And please don’t worry about making ‘perfect’ circles, that’s really not the aim, in fact it’s often the misshapen, wonky circles I draw that I like the best – because they reflect my wonky body with its aches and pains, or my tense breath after a busy week of teaching. Let the circles just be what they are. Let you be just who you are – in this moment. Materials: You will need a sheet of paper, a pencil, pen, stick of charcoal, or a watercolour brush and a thick wash of paint (I’ve been using acrylic) or ink. I like using a simple black, blue/black, or a sepia or ochre colour – but you could make them in any colour you wish. Stop – Even if you don’t have a lot of time, bring your materials together mindfully. Be aware of your body moving slowly. Sit for a moment in front of your paper. Look – Close your eyes and look within. Notice how you’re feeling, what the inner weather of your emotions and thoughts are like in this moment. Breathe – Bring your awareness to your breath. See how it is a circle of in and out. Follow the circles of your breath for a few moments holding your experience within it. Look – Visualise an ensō. See that circle in your mind’s eye, holding a sense of what it it might mean to you today. Breathe – Take your pencil, pen, charcoal or brush in your hand, staying aware of how it feels and how you are holding it. Breathe – If you are using a brush, load it with enough ink or watercolour to make a circle in one single stroke or gesture – without needing to reload the brush. Create – Draw your ensō on either an in-breath, or an out-breath – or on a full circle of the breath (in and out). Experiment and see what feels right. Stop –Remember this is one moment in time, all that your are, all that is, in this one mark on the page. Sign your ensō and then place it somewhere you’ll see it regularly, so that it can remind you of the importance of mindfulness, of the simplicity of the present moment. Traditionally, ensō are accompanied by a sacred text, a koan or quote from spiritual texts or sutras. You might also like add some words to your ensō – a mantra, affirmation, an expression of gratitude, whatever you wish. Or you may leave the paper with just its circle. This is a beautiful exercise. Thank you for revealing it to me! I would love to make Ensi with you. Where should I post my drawing? I’m so happy you’re joining me – indeed, us. People from New Zealand to Scotland are currently part of this impromptu project! Please share on the Art of Mindfulness Facebook page. At the end of the month, I’ll do another blog post with other people’s enso. on the strength of this is shall go out and buy a moleskin book and do one a day till it is finished, and see what happens. thanks for the inspiration. your wonky circles reflect your wonky body, mine will reflect my wonky mind, full of lumps, bumps and twists.